Generous – When Agabus showed the Christians at Antioch that there was going to be a great famine over all the Roman world, they determined to send relief to the brethren in Judea. Antioch was in that Roman world and would suffer themselves, but they sent relief to others anyway (Acts 11:28-30). The blueprints for a growing and vibrant church call for it to be generous, “ready to give and willing to share” (1 Timothy 6:18). Inclusive – A quick look at the origins of the church at Antioch (Acts 11:20-21) and the prophets and teachers who called it home (Acts 13:1) reveals that it was an inclusive church. The church at Antioch had its origins during the time of the persecution that arose following Stephen’s death. Certain men from Cyprus and Cyrene went to Antioch and preached Jesus to the Hellenist Gentiles. The hand of the Lord was with them and a great number of the Gentiles believed. This made Antioch the first church among the Gentiles. Later in Acts 13:1, we find that the church had five teachers who reflected the inclusive nature of the church. There was “Barnabas” (a Levite from Cyprus by way of Jerusalem); “Simeon who was called Niger” (possibly a dark skinned African); “Lucius of Cyrene” (an African from present day Libya); “Manaen who had been brought up with Herod the tetrarch” (high-class royalty); “and Saul” (a Jew who had formally killed Christians). The blueprints for a growing and vibrant church call for it to be inclusive of different races, backgrounds and social statuses recognizing that “There is neither Jew nor Greek, there is neither slave nor free, there is neither male nor female, for you are all one in Christ Jesus” (Galatians 3:28). Outward Thinking – When the Spirit called out Paul and Barnabas for the work of preaching the gospel to the world (Acts 13:2-3), the church at Antioch answered the call because they were an outward thinking congregation. How easy it would have been for them to want to hold on to its best teachers, but not this church, it was outward thinking. Antioch developed its people (the church had many teachers), encouraged risk (laid hands on Paul and Barnabas), and trusted God to provide (sent them out with prayer and fasting). The blueprints for a growing and vibrant church call for it to be outward thinking by developing its members so they can “go into all the world and preach the gospel to every creature” (Mark 16:15). Committed – When some Judeans came teaching error about circumcision, the church at Antioch stood firm by being committed to the truth (Acts 15:1-3). In fact, they were so committed to following the truth; they sent Paul, Barnabas and certain others to Jerusalem to determine why this error was coming from Jerusalem. The blueprints for a growing and vibrant church call for it to be committed to “searching the scriptures” to determine God’s will (Acts 17:11) and once it is determined following it whatever it might be (ref. Acts 15:30-31). Welcoming – When Paul needed a place to go home to after his first and second missionary journeys he went back to Antioch (Acts 14:29-28, 18:22-23). The reason for this is that the church at Antioch was a welcoming church. They not only were welcoming to Paul, but they also made Barnabas (Acts 11:25-26), Judas and Silas (Acts 15:33-34), Mark (Acts 12:25, 15:35-39) and many others (Acts 15:35) feel right at home during their long stays in Antioch. The blueprints for a growing and vibrant church call for it to be welcoming to all by being an oasis that “refreshes the hearts of the saints” (cf. Philemon 1:7) to its members and those that are just passing through. Forgiving – Closely connected with the idea that the church at Antioch was welcoming is also the idea that it was a forgiving church. When Paul and Barnabas returned to Antioch from taking aid to the church in Jerusalem (Acts 11:27-30) they brought back with them a young man name John, or as we commonly call him Mark (Acts 12:25). Mark accompanies Barnabas and Paul on their first missionary journey (Acts 13:4-5) but abandons them in Perga in order to return to Jerusalem (Acts 13:13). The next time we have a reference of Mark is in Acts 15:35 where we find him once again in Antioch. Why was he there? 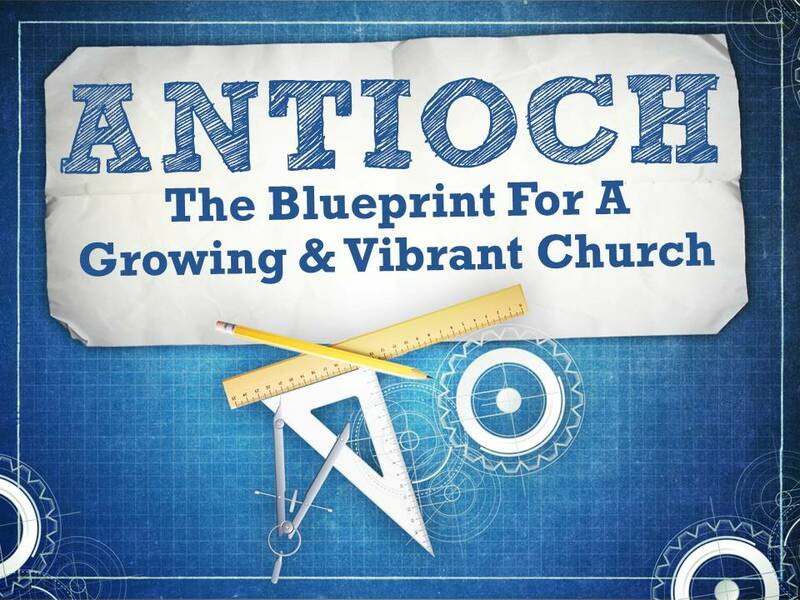 Could it be that Antioch was a forgiving church? The young man who left Antioch a hero but faltered on the way could go back because they were a forgiving church. The blueprints for a growing and vibrant church call for it to be forgiving and give people second chances, because “all have sinned and fall short of the glory of God” (Romans 3:23). The church at Antioch was a great church. It was growing and vibrant, not because of its building or programs, but because of its people who sought to live out their faith by being the very best they could be. We all would do well to build our congregations after their blueprints so that we too can be growing and vibrant churches. ← There Is Still Room!